This bag is stylish, there’s no doubt about it. The Velos Messenger bag comes in several themes: Chocolate and Wheat. Each one of these come with two different colored straps. 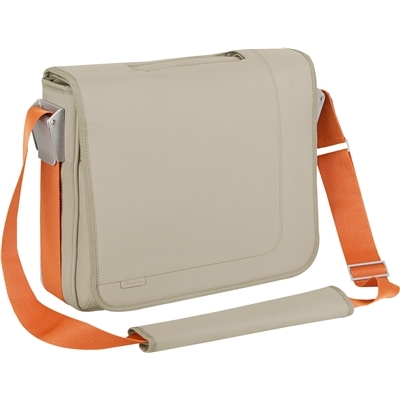 One of Targus’ main features on this bag is incorporating interchangeable colored straps. Now some may say this is not a big deal. However, having a colored strap that goes around the bag, and with a single switch, you can change the entire look of this messenger bag. That seems like a big deal. The Velos messenger bag definitely receives some style points. Targus also focused on keeping this bag slim, and allowing more portability. First, they keep the pockets down to a minimum. In my opinion, they were able to achieve this without sacrificing too much usability and compartments, but do not expect as much carrying space as a backpack. Another step they took to keep the bulk down was a retractable handle on top. This handle lies flat against the case when not used, and is able to be used just like a regular laptop handle when extended. The Velos messenger bag has an inner compartment, and an outer compartment. The inner compartment holds the laptop secure between two ventilated pads, and neoprene. The laptop compartment is able to hold up to a 15.4” Laptop (measured diagonally). This inner compartment also has space for several books or folders. A small lid covers this compartment, and is attached by Velcro. The outer part of the bag has a zippered pocket, which is useful for a charger, your business card, possibly even a keyboard. Also, on the back of the bag there is a slim pocket for a folder or a couple of sheets of paper. The outside of the bag has three pouches that aren’t held together by Velcro or zippers. For me, these pockets are mainly used to hold my portable mouse, and my iPod Touch. Not having any Velcro or zippers is not a problem if the bag is kept upright, but if not, it becomes a slight problem for holding valuables. The colored strap goes through these two plastic attachers that remind me of those used on airplane seatbelts. The strap goes all the way through the bottom of the bag, and out the other side. If The Design of this bag seems difficult to understand through text, please refer to our photostream on the right. Quality: I found the quality of this bag to be above average. Targus puts the quality where it needs to be, so the consumer is gets the best value. For instance the strap attachments are made of plastic, but the most important part, the laptop compartment, is fully supported with air ventilated pads, and held tight by a flexible neoprene sheet. I give the Targus Velos Messenger bag a 4.5 out of 5. The Velos Messenger bag is great for those who want a slim, and protective case, but also want style. Overall, I would recommend this carrying bag for stylish students, and those wanting to travel light.